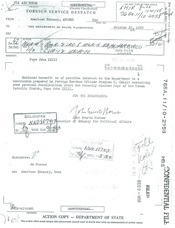 The following declassified U.S. Department of State document on "Pope" John XXIII was filed on 10-29-58. A mere three days after his plotted criminal usurpation of the papal throne, from the lawfully elected pope, Gregory XVII ("Cardinal" Siri). This official U.S. Government secret document, provides important information on the modus operandi of the "naive older prelate", Angelo Roncalli, whose satanic act launched the Apostasy. Very important document which outlines the modus operandi of an experienced operative who gave an appearance to the WORLD as benign & harmless.